The Iowa Department of Natural Resources reports unseasonably warm weather is causing ice conditions to deteriorate across much of the state. Lakes with the best ice are north of Highway 3. DNR Fisheries Bureau Chief, Joe Larscheid says you should use caution and test the ice thickness frequently if heading out and trust your instincts — if it doesn’t look right — don’t go out on the ice. He recommends you go with someone else and take some basic safety equipment. Larscheid says bring a floatable rope and ice picks. If you do fall through the ice, you can use the ice picks to climb out of the water. He also recommends some kind of inflatable cushion that you sit on when you’re fishing on a bucket, and he says wearing a flotation coat or any kind of personal flotation device is always good. Larscheid says when the ice is thick and good for fishing it becomes the equalizer for those who don’t have a boat to use on the water to get to the best fishing holes. 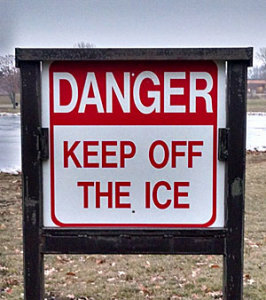 But it can be deadly if you go out on ice that isn’t thick enough to hold. you. Go to the DNR’s website to find out more about ice safety and ice fishing.